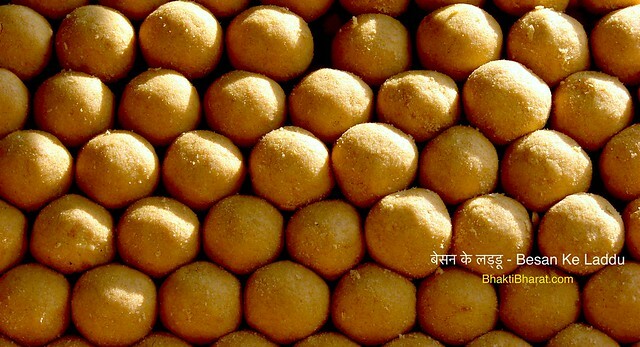 Besan Ke Laddu is the dearest sweet of Lord Ganesha that's why they are used for the offerings during Ganeshotsav. Let us know the simplest method of making them. First, put ghee in a pan and heat it on a medium flame. When ghee melts down, add gram, mix it well and slow down the flame. Stir the gram flour well with the help of a spoon. After roasting gram flour for 20-25 minutes, its colour starts changing and roasting smell comes out. Now, ghee starts coming out from the gram flour and it turns to golden in colour. This shows that gram flour is well prepared and ready. Take out the gram flour in another vessel and keep it for cooling. When the gram flour gets lukewarm, add Bura and cardamom powder in it then mix it well. Now prepare laddus with the help of hands. After making laddus with hands, put a piece of cashew or pistachio in the top. In this way, Besan Ke Laddu is prepared for indulgence.